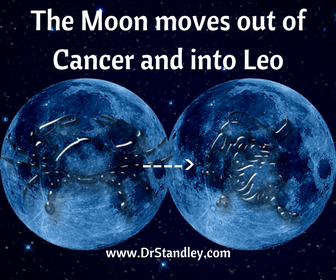 The Moon moves out of Cancer and into Leo at 1:09 PM EDT. Today there are three (3) aspects to the Moon, with the first two aspecting the Cancer Moon and the third aspecting the Leo Moon. This is because the Moon will be changing signs at 1:09 PM EDT. Remember, the Moon stays in a sign for 2 to 2-1/2 days, which is why it only takes 28 to 31 days for the Moon to travel through all 12 Sun Signs. We wake up on this Earth Day with the Moon sextile Venus, which makes for a healthy and happy family and/or marriage. This is because the Moon rules the home and family, while Venus rules committed relationships and personal finances. This is a wonderful aspect to talk about feelings, finances or even for getting married. Keep in mind this aspect is hitting early at 3:46 AM EDT and has an 'orb of influence' of 12 to 14 hours before and after its exactness. Many will find themselves cooking a big breakfast or going out for Sunday brunch. Just two hours later the Moon will then square Uranus, but just keep in mind that since lunar aspects have a 12 to 14 hour 'orb of influence' before and after their exactness, this means the first two aspects are closely overlapping each other. My oh' my, how quickly the energy changes. BAM! In the blink of an eye, the situation, tone or atmosphere changed. Maybe you planned on doing one thing and then a phone call came in that changed your Sunday plans and now you are doing something else. This energy can create a bit of chaos, which means you could be in a hurry and forget the lawn chairs and cooler. Maybe you are getting ready to go somewhere and became distracted and forgot your wallet or phone and this changes everything once you get to where you are going. When Uranus is present, take your time moving around because it is a quick chaotic planet that behaves like lightning. Pluto turns Retrograde today, which is taking us backward over the same degrees we just experienced. Retrogrades are do-overs that give us a chance to do something over before we progress forward. IT'S A DO-OVER! Pluto is the modern-day ruler of Scorpio, whereas Mars is the ancient ruler of Scorpio. This planet is all about change, when then morphs into full-blown transformation. Maybe you didn't 'get the get' of what needed to change and now you are getting a chance to receive that understanding loud and clear. Do not be afraid of Retrogrades my dear little mentators. Retrogrades are here to serve you (to help you) not the other way around. Mars and Pluto are conjunct right now in an 'applying orb' (meaning approaching). You should be feeling the prodrome (early symptom) of this energy. Mars conjunct Pluto has an enormous pool of energy that should be used 'as needed' and 'when needed'. Do not squander this energy on acting crazy or as a volcanic temper because you will regret it. Pluto does like control, so if you are going to control anything, control yourself. This conjunction has a friend in the area, that being Jupiter, as Jupiter sextiles this conjunction. When you use your power rightly, rewards are given, more power is given and promotions and/or raises are given. Remember, Jupiter e-x-p-a-n-d-s whatever it touches. Use this conjunction to tap the Universal Power Source (God). This is an incredibly spiritual aspect that should not be wasted. God has us retracing our steps for a reason. It's like we are on an Easter egg hunt and we stepped over the golden eggs. So Pluto is taking us backward in degrees to retrace our steps to give us another shot at finding those eggs that will change our lives. 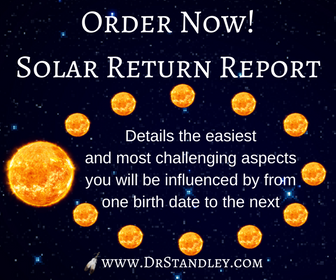 Do not buy into the fear about Retrogrades or you will miss the golden eggs. The last aspect today is the Moon square the Sun, which is estrogen (mom) challenging testosterone (dad). The male and the female energies are not playing well together when this aspect shows up on the scene. Do not force family night if someone is having a bad day. This can bring up memories from childhood (about the parents) that make couples pissed off at each other. This aspect has 'emotional insecurity' written all over it. It's okay to do your own thing if you do not want to play house today. Give your relationship some space as the time gets closer to 5:46 PM EDT and beyond through the evening. 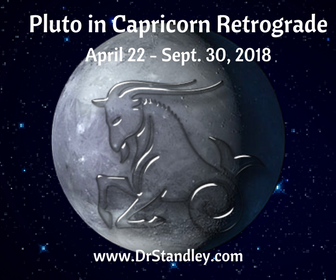 Download the 'Pluto in Capricorn Retrograde' chart wheel here! The Moon in Cancer sextile Venus in Taurus at exactly 8:40 AM EDT. You will feel this energy within 12-14 hours 'before and after' it occurs. The Moon in Cancer square Uranus in Aries at exactly 10:58 AM EDT. You will feel this energy within 12-14 hours 'before and after' it occurs. The Moon in Leo square the Sun in Taurus at exactly 5:46 PM EDT. You will feel this energy within 12-14 hours 'before and after' it occurs.